It is well known that ovarian mature cystic teratomas (MCTs) occasionally go through malignant transformations. Among these, approximately 75% of histological types are squamous cell carcinoma, with the other types being exceptionally rare. We report an extremely rare case of ovarian clear cell carcinoma arising from ovarian mature cystic teratoma. The case was a 71-year-old woman with abdominal distention. Ultrasonography and magnetic resonance imaging showed a huge mass in her abdominal cavity. Fluorodeoxyglucose-positron emission tomography (FDG-PET) showed FDG uptake not only in the pelvic tumor but also in the hepatic nodule, thus suggesting metastases. We performed a total abdominal hysterectomy, bilateral salpingo-oophorectomy, and an omentectomy. The pathological diagnosis showed clear cell carcinoma of the right ovary which arose from the MCT with malignant transformation pT2aNXM1. Although the patient underwent chemotherapy, she died after 17 months. 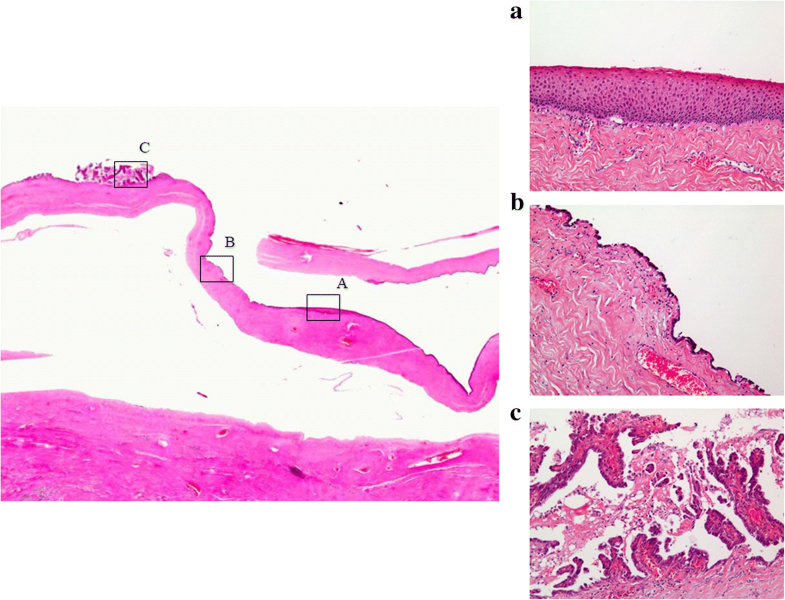 This case is histologically characteristic of the proof of transition from simple squamous epithelium via simple glandular epithelium to papillary change with atypia. This is the first case report of unaccompanied clear cell carcinoma arising from MCT reported in English literatures. Mature cystic teratomas (MCTs) are the most common germ cell tumors of the ovary, and malignant transformation of MCTs has been found in 1–2% of cases . Seventy-five percent of these transformations are squamous cell carcinoma, with the other types being exceptionally rare . 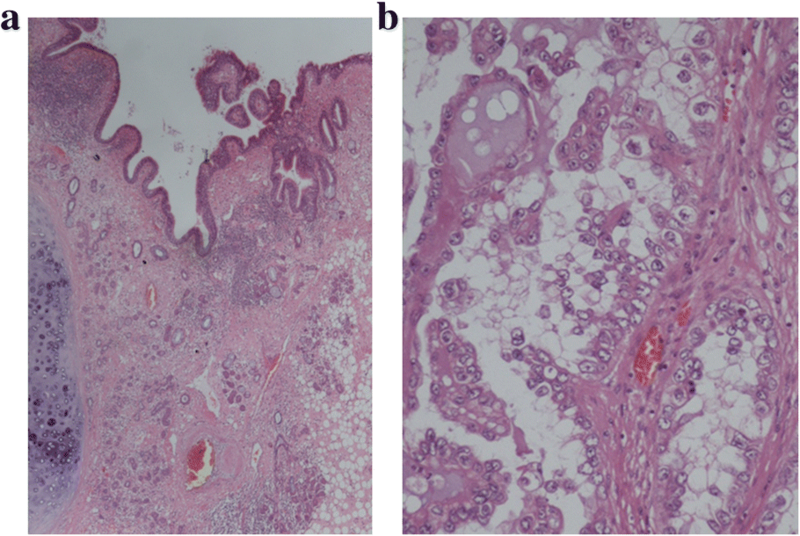 We report the first known case of ovarian clear cell carcinoma arising from MCT. A 71-year old female, gravida 2, para 2 presented with abdominal distention which had worsened over the previous year. Her past medical history was appendicitis, and an appendectomy was performed in her thirties. Her past family history was unremarkable. A pelvic examination identified a very large mass in both hypochondrium which was hardly movable. Pelvic and abdominal ultrasonography showed a huge cystic mass with a solid component. Serum tumor marker levels were carcinoembryonic antigen (CEA): 2.0 ng/mL (normal < 37.0), CA19–9: 459.2 U/mL (normal < 37.0), SCC: 18.9 ng/mL (normal < 1.5), and CA125: 329.9 U/mL (normal < 35.0). Other blood examination results were unremarkable. A pelvic MRI showed a huge cystic mass with a nodular component which was enhanced and under diffused in diffusion weighted image (Fig. 1a). 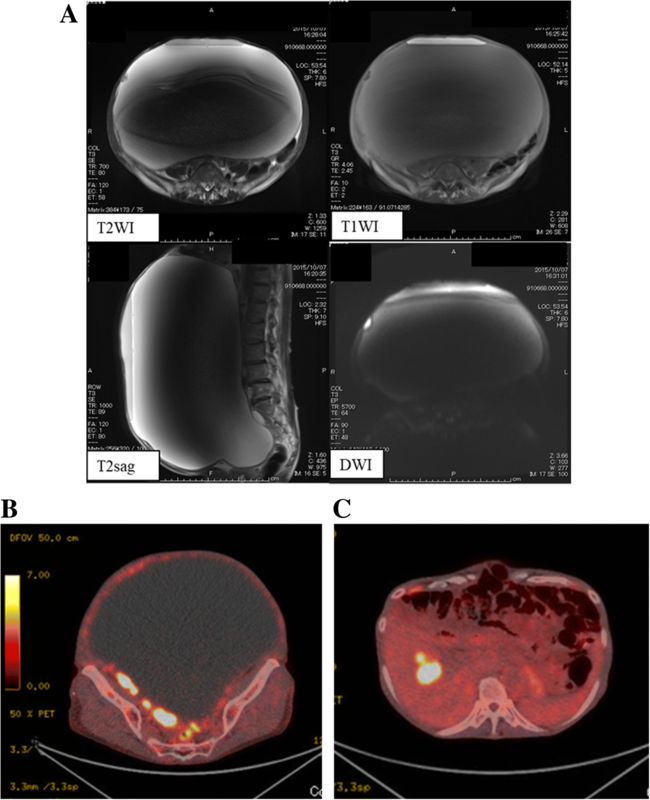 Computed tomography (CT) showed a 3 cm mass in the liver, and fluorodeoxyglucose-positron emission tomography (FDG-PET) showed FDG uptake not only in the pelvic tumor (SUVmax = 22.9) but also in the hepatic nodule (SUVmax = 13.7), thus suggesting metastases (Fig. 1b, c). Ovarian cancer and liver metastasis was suspected on these data, and a subsequent percutaneous liver biopsy was performed. The pathology showed metastatic cells in normal hepatocytes, and a diagnosis of poorly differentiated carcinoma was made (Fig. 2). Immunohistochemical staining showed that p40, p63, and hepatocytes were all negative, thus denying primary hepatocellular carcinoma. Therefore, a clinical diagnosis of ovarian cancer stage IVB with malignant transformation of the MCT was made. A total abdominal hysterectomy, bilateral salpingo-oophorectomy and partial omentectomy was performed. The left ovary was enlarged (about 300 mm) and filled with 13,000 ml of yellowish fluid. Adhesion was not particular, and the uterus and right ovary appeared to have no remarkable changes (Fig. 3). The cytology of ascites was negative. The patient’s postoperative course was uneventful. The pathological findings revealed that most of the ovary consisted of an MCT with squamous cell epithelium, cutaneous appendage and cartilaginous tissue (Fig. 4a); however, some parts consisted of papillary or glandular lesion with hobnail-like atypical cells (Fig. 4b). We made a diagnosis of left ovarian clear cell carcinoma and malignant transformation of MCT based upon the proof of transition from simple squamous epithelium via simple glandular epithelium to papillary change with atypia (Fig. 5). Histopathology showed no endometriosis in either ovary and, therefore, endometriosis-associated malignancy was denied. 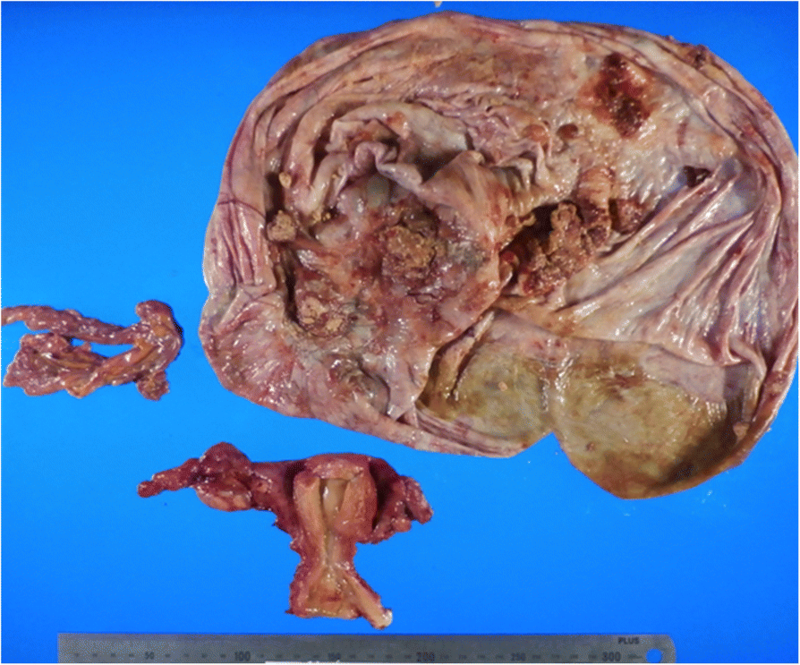 However, the uterus and omentum showed no signs of malignancy. 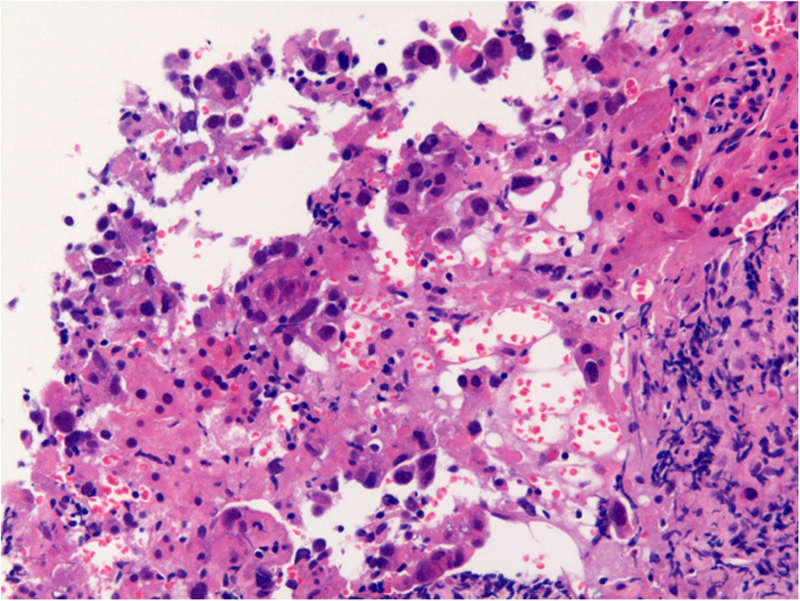 The left fimbria of the fallopian tube had a lymphovascular space of invasion with calcifying carcinoma cells (Fig. 6a, b). However, the uterus and omentum showed no signs of malignancy. Immunohistochemical analysis of the left ovary indicated that AE1/AE3, CK7, PAX-8 and Napsin A were all positive, and that 34βE12 and P53 were slightly positive (Fig. 7a, b). Although CK20 and vimentin were negative, Ki-67 (MIB-1) index was 25% positive in the carcinomatous part. Moreover, PAS was positive in the stromal part, and PAS and ALB were both positive in some glandular lesions. This was classified as stage IVB (pT2aNXM1) according to the International Federation of Gynecology and Obstetrics (FIGO) 2014 classifications. The patient subsequently underwent chemotherapy with 3 courses of paclitaxel and carboplatin. Afterward, CT scanning revealed a vanished hepatic metastasis and emerged swelling of the para-aorta lymph node. Although 3 courses of doxorubicin were administered, the para-aorta lymph node continued to enlarge. As chemotherapy was not effective due to her progressive disease, the patient began to receive the best possible supportive care. After 17 months from the operation, she passed away. MCTs are common in women of childbearing age and account for 10–20% of all ovarian neoplasms. MCTs occur bilaterally in 10–17% of patients, and most patients with MCT are asymptomatic. However, they can develop pain and a sensation of abdominal fullness due to the mass . MCTs might arise from germ cells by the failure of meiosis II or from a premeiotic cell in which meiosis I has failed . A secondary malignant transformation of the various tissue components of MCT can occur, typically in postmenopausal women, and the prognosis is usually poor [3, 5–7]. The reported incidence of MCT is 1.2–14.2 cases per 100,000 per year, and the proportion of cases in which malignant transformation occurs is 0.17–2% . Malignant transformation of MCT accounts for 1.5% of all ovarian malignant tumors and accounts for 36% of malignant ovarian germ cell tumors . Hackethal et al. reported a mean age of 32 years and a mean tumor size of 64 mm for MCT, as well as 55 years and 148 mm for malignant transformation. Therefore, a patient age over 40 years and tumor size are predictors for secondary malignant transformation . Mori et al. reported that the combination of the patient’s age (> 40 years) and serum SCC antigen level (> 2.5 ng/mL) was 77% sensitive and 96% specific for malignant transformation . The most common form of malignant transformation of MCT is squamous cell carcinoma, occurring in about 75% of cases, and 7% are adenocarcinoma . We reviewed literatures concerning epithelial ovarian cancer arising from MCT (excluding squamous cell carcinoma, mucinous carcinoma and thyroid carcinoma) from the last 20 years (Table 1) [10–23]. Table 1 shows that their adenocarcinomal histological subtypes arising from MCT are prostate-type 7adenocarcinoma , small cell carcinoma [11, 19], sebaceous carcinoma [12, 15, 18], undifferentiated carcinoma , carcinoid tumor [14, 20, 22], signet ring mucinous adenocarcinoma , large cell neuroendocrine carcinoma , urothelial carcinoma , and apocrine adenocarcinoma . This case is the first case report of clear cell carcinoma arising from MCT reported in English literatures. Due to the rarity of this tumor, adjuvant treatment has not been prospectively evaluated. As the selection of an effective treatment for clear cell carcinoma arising from MCT has not been established, we administered paclitaxel and carboplatin as the standard chemotherapy for ovarian carcinoma. However, clear cell carcinoma of the ovary is a quite unique ovarian tumor and shows resistance to platinum-based chemotherapy . This case, which was clear cell carcinoma arising from MCT, also indicated a poor prognosis though chemotherapy. Consequently, further studies should evaluate other more effective agents for clear cell carcinoma arising from MCT. When malignant transformation of MCT is diagnosed, it is very important to determine whether the clear cell carcinoma coexists incidentally or that the clear cell carcinoma arises from MCT. So far, three cases of the coexistence of MCT and clear cell carcinoma have been reported [25–27]. However, in those reports, it is not pathologically proven that clear cell carcinomas have arisen from MCT. This case is histologically characteristic of the proof of transition from simple squamous epithelium via simple glandular epithelium to papillary change with atypia. To our knowledge, this is the first case report of unaccompanied clear cell carcinoma arising from MCT reported in English literatures. This paper was approved by the Ethics Committee of the Osaka Medical College. We have no commercial or financial incentive associated with the publication of the article. KM, YTa, ST, and KA carried out surgery of the patient. YTe and KM drafted the manuscript. HM, YK, TT, and HS reviewed papers about the MCTs. TY and ST provided pathological evaluation of the specimen and peformed the immunohistochemical staining of the tumor. YTe and MO conceived of the study, and participated in its design and coordination. All authors have read and approved the final manuscript.